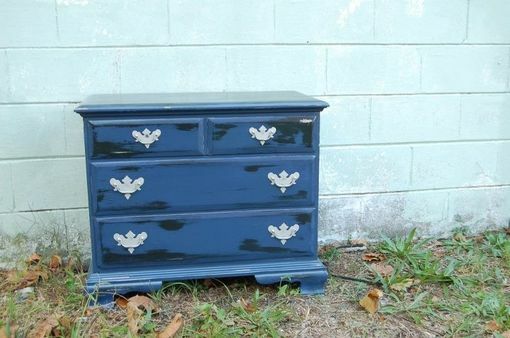 We call it the Deep Blue Bachelor's Chest. It is a solid maple bachelor's chest with three drawers and original hardware, painted deep indigo and heavily distressed to reveal black undercoat. Hardware has been painted in brushed nickel and slightly distressed to match dresser finish. 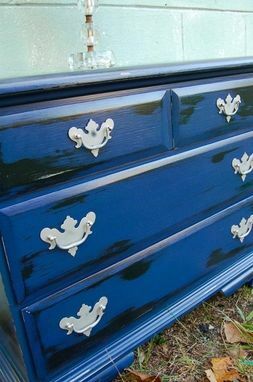 Chest is topcoated with polyurethane to protect finish. Dimensions: Chest measures 27" high and 32" wide and 16.5" deep.